After a long, rainy week the perfect thing to warm me up was a trip to David’s Dumpling & Noodle Bar. The cozy yet modern atmosphere made for a great experience. When walking towards my table, it was hard to miss the large mural on the back wall that really captured the essence of the restaurant. 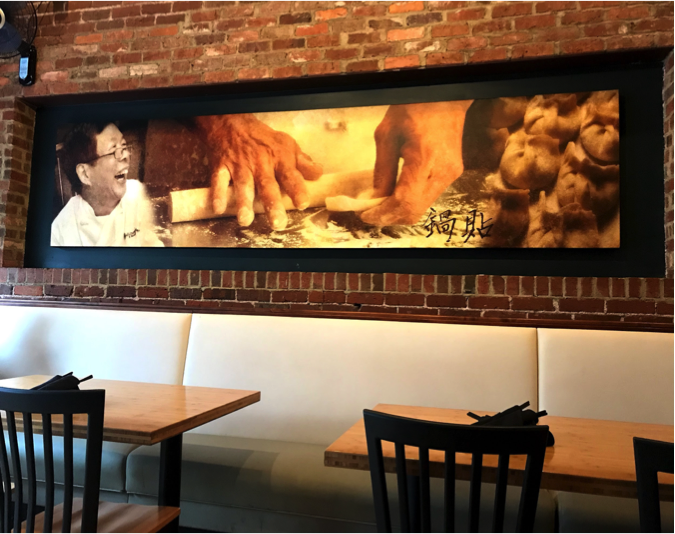 The picture portrays the owner, Chef David Mao, laughing and crafting his famous dumplings. I sat down with friends and was greeted by friendly waitstaff. We browsed over the lunch menu, which had many options to choose from. While sipping on my sweet tea, which is included with lunch, I decided that I had to try David’s Original Half-Fried Dumplings. They were filled with pork and paired with cabbage and onions. 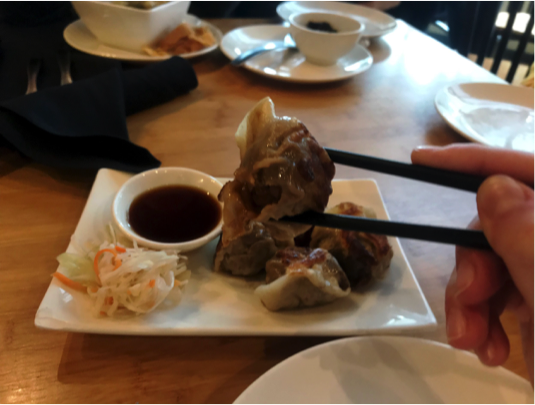 The dumplings were warm, savory and packed with flavor. Needless to say, my expectations were met…and exceeded. My entree was bursting with color and caught my eye as it made its way to the table. 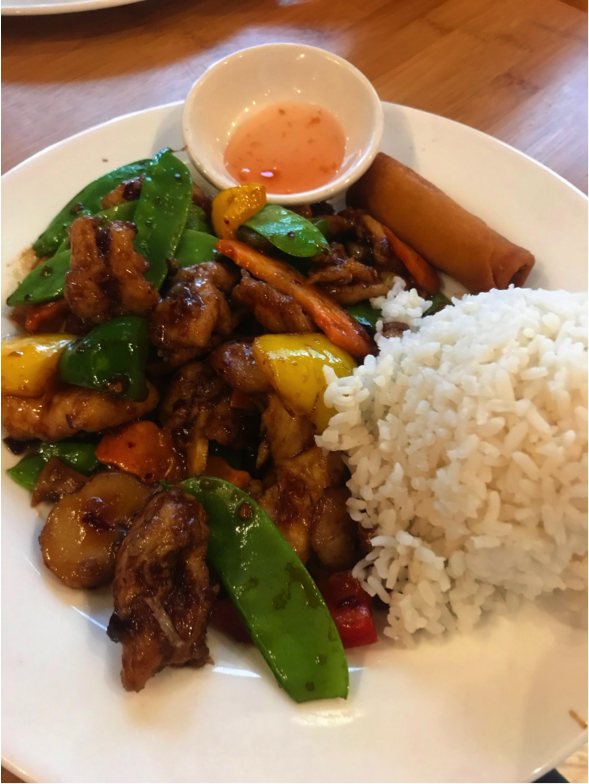 I ordered the Ginger and Garlic Chicken, which came with a veggie spring roll. All of the flavors in the dish complemented each other well with the sweetness of the peppers but spiciness of the chicken. The spring roll had the ideal amount of crunch and the duck sauce on the side was delicious. My friends also loved their meals, which included Wonton Soup, Pad Thai and Stuffed Eggplant with Shrimp. 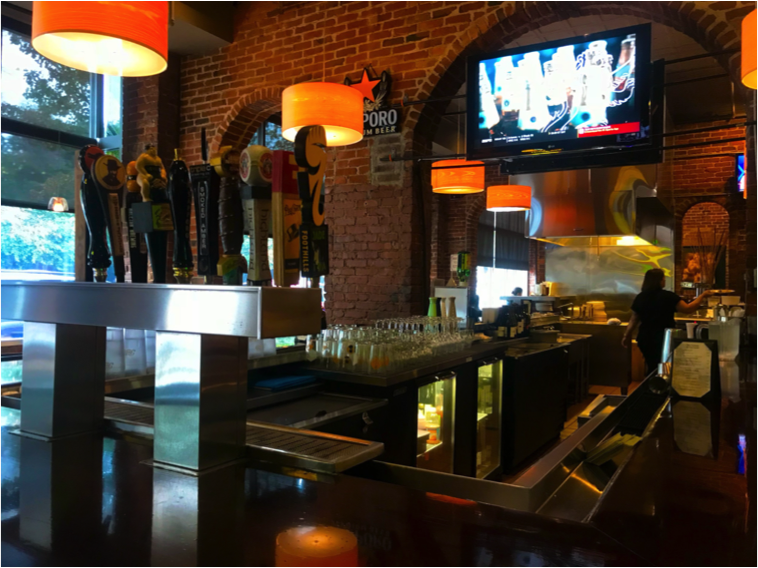 The menu offers something for everyone, so you can’t go wrong when deciding what to get. The lunch menu has good prices, large portion sizes and quick service. It’s safe to say everyone left satisfied with full stomachs! David’s Dumpling & Noodle Bar is also open for dinner with an even larger menu to choose from. In addition, they have a full bar where you can eat and drink beer, wine or sake. Chef Mao’s Pan-Asian menu has its own flair that hits the spot at any time of day. 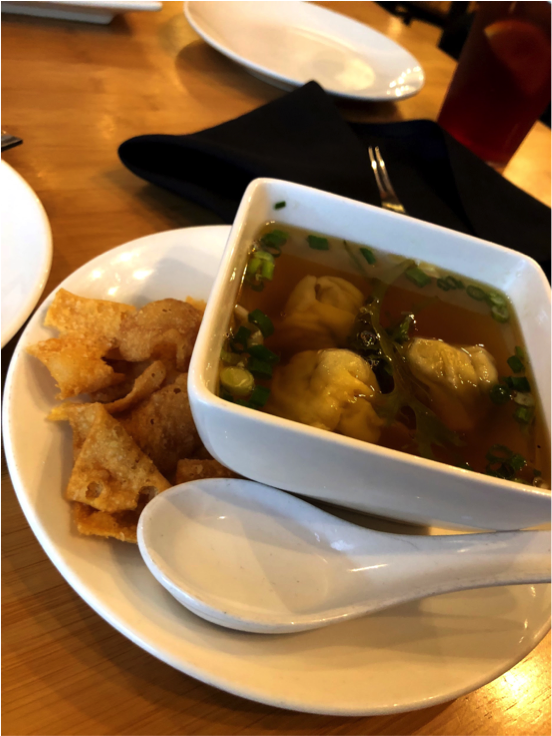 Be sure to take a trip to David’s Dumpling & Noodle Bar, located at 1900 Hillsborough Street!